This entry was posted on Wednesday, July 19th, 2006 at 3:01 pm. 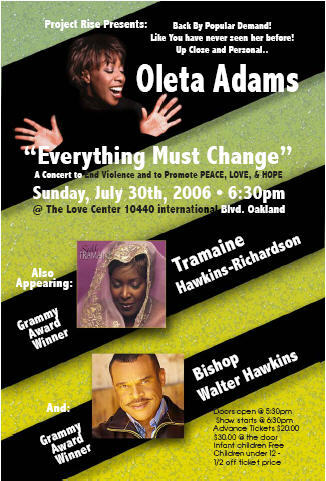 It is filed under Music News/Info and tagged with Bishop Walter Hawkins, gospel, Love Center Church, Oakland, Oleta Adams, Tramaine Hawkins-Richardson. You can follow any responses to this entry through the RSS 2.0 feed.